Rajasthan Subordinate and Ministerial Service Selection Officials announced 62 Investigator Vacancies, through RSMSSB Recruitment 2019 Notification. This is a good chance for the Candidates, who are searching for the Government Jobs in Rajasthan State. Apparently, the officials are looking for the Candidates, who completed their Graduation Degree in Maths or Statistics from any Recognized Institute or University in India as the Educational Qualification. Starting from 24th January 2019 to 23rd February 2019 all the interested people can apply for the RSMSSB Investigator Recruitment 2019. 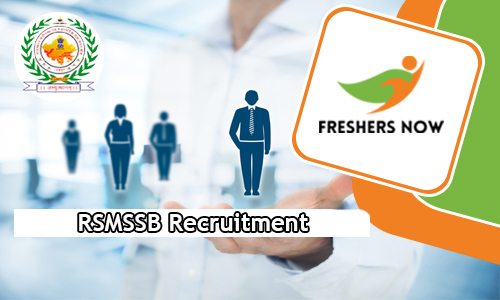 Check out the complete details related to the RSMSSB Recruitment 2019. And then proceed to apply, after only if you are eligible, and have had all the Qualifications correctly. Remember the officials of the Rajasthan Subordinate and Ministerial Service Selection are not going to accept the applications if the applicant is not having all the Qualifications correctly. Therefore, try to check all the information. Well, if you are willing to check more other Government Jobs, as other options, you can find them on our site Freshersnow.com. Apparently, the contenders, who are interested in applying for the RSMSSB Recruitment 2019, should have completed their Degree in Maths or Statistics from any Recognized Institute or University in India, as the Educational Qualification. Now, the candidates, have to possess the correct age too. Contenders age must be between 18 years to 40 Years. For Age Relaxation details, check the official RSMSSB Recruitment 2019 Notification. Apart from Interview, there are no other selection rounds, that an individual has to clear. Recheck and submit the application form, before the final date. Hope we included the complete information related to the RSMSSB Recruitment 2019. Check more detailed articles like this on our site. RSMSSB Recruitment 2019 Notification is released by the Rajasthan Subordinate and Ministerial Service Selection Officials. All the interested candidates, from the Rajasthan who completed their Degree in B.Sc, can apply for the 28 Junior Scientific Assistant Posts that are available in the organization. Therefore, go on and check all the details, related to this RSMSSB Junior Scientific Assistant Recruitment 2019. Apparently, starting from 18th January 2019, candidates, can apply for this Recruitment until 19th February 2019. Applications should be submitted in the Online Mode. For that, you need to visit the official site of the Organization at www.rsmssb.rajasthan.gov.in. Check out the new notification from the Rajasthan Subordinate and Ministerial Service Selection Officials. They are going to hire the candidates, for the available Junior Scientific Assistant Vacancies in the Organization. Therefore, after going to through all the Requirements, that are clearly mentioned in the RSMSSB Recruitment 2019 Notification, interested candidates, can submit their filled RSMSSB Junior Scientific Assistant Online Application Form 2019. If the aspirants are not eligible, they can always check more other Recruitments on our site Freshers Now. As Per the information in the Advertisement, an individual need to complete their Degree in B.Sc, from any Recognized Institute or University in India, as the Educational Qualification. Accordingly, applicants age must be between 18 years to 40 Years. Candidates, have to clear the Written Test to get placed in the organization. Well, the selected candidates will get the salary as per the norms of the organization. From, there, go to the Notification Section. Over there, you will find the Advertisement, for the Junior Scientific Assistant Vacancies. Open it and check the complete requirements clearly. And then if you are eligible, fill the application form. Like all the information, we sourced about RSMSSB Recruitment 2019? Well, then check more such helpful articles, on our site. RSMSSB Recruitment 2018-2019 Notification is out. And this time the officials of Rajasthan Subordinate and Ministerial Service Selection released notification for total 277 Vacancies. If you clearly check the advertisement, you will know that the available positions are Supervisor, Industry Propaganda Officer, Industry Inspector, Financial Investigator, Handloom Inspector, Salts Inspector. Therefore, all the aspirants, who are looking for the Government Jobs in Rajasthan State, can check this article. This post contains all the important information about the RSMSSB Recruitment 2018-2019. If you are willing to know more about the requirements, you should proceed to check this post further. Now, according to the information in advertisements, the final date to submit the application form the Supervisor is 2nd May 2018. While for remaining all the Deadline to submit the filled application form is 20th April 2018. More other details are arranged in next sections of this post. Check them all. Tired of searching everywhere to get information related to the RSMSSB Recruitment 2018-2019 Notification? then you stop in this article, will make you happy. Because, we have made this article, with complete information that is given in the RSMSSB Recruitment 2018-2019 Notification. Through this post, all the applicants can get data such as Name of Vacant post, Number of Vacancies, Age limit, Age relaxation, Application Fee, Salary, Selection Process and all. Apart from all these, at the end of this article, we even gave the direct link to download the RSMSSB Recruitment 2018-2019 Notification. So, just by clicking on the link, the contenders can download the advertisement easily. And also, all the Job hunters can even check the Steps to apply for the RSMSSB Recruitment 2018-2019 listed at the bottom of this post. And those steps will help you all to apply for the RSMSSB Openings 2018-2019. Please check the above table. And it contains all the basic and correct details about the RSMSSB Recruitment 2018-2019 Notification. This will let you all have an overall idea about the Openings. Check them and proceed to find out other important information. For now, the officials of the Rajasthan Subordinate and Ministerial Service Selection are accepting the applications. But for the Supervisor Vacancy, the aspirants can actually start applying from 5th April 2018. Before that, you all need to know the complete information clearly. You can all get them from the next sections of this post. Apparently, all the contenders who had finished their B.Sc, Masters Degree or any Graduation Degree from any recognized institute or University in India are eligible to apply for the available 277 Vacancies. This is the Educational Qualification. For each and every post-Wise Educational background, you have to check the official RSMSSB Recruitment 2018-2019 Notification. For the convenience of the Job Searchers, at the end of this post, we even gave the direct link of the advertisement, click on it and check the education and work experience information that you need to know. Now, after the Educational Qualification, all the people should be aware of the correct age. And the contenders need to have to right age as mentioned in the notification as of on date of applying. More other information about this is updated in the next sections of this post. Apparently, the Minimum age of the applicants can be 18 years. But the Maximum Age for all the positions is 40 years. Candidates should here note that the minimum age will differ for the Supervisor Position and other Positions. Either you can this post further or the official RSMSSB Recruitment 2018-2019 Notification linked at the bottom for the post-Wise age limit. And if you are worried about age relaxation, that is updated clearly in the next sections of this post. You can have a look. Remember that if any of the Qualification is missing, your application is waste. Therefore, to help you from feeling disappointment, here we are before starting to apply for the RSMSSB Recruitment 2018-2019, only if you have had all the Qualifications correctly only. Otherwise, you can find more Recruitment Notifications on our site Freshersnow.com. All you have to do is check them all patiently, till you find the one that you are eligible to apply. Now, next important part that all the contenders should know that is given in the RSMSSB Recruitment 2018-2019 Notification is application Fee. According to the data in the advertisement Rs.450 for the General/UR and Creamy Layer OBC people. Also, the OBC Candidates should pay Rs.350/-. Meanwhile, the SC/ST/PWD Contenders should pay Rs.250/- as the Application Fee. Remember, to check the advertisement twice before paying the Application Fee. Now, Soon after submitting the application form for the RSMSSB Recruitment 2018-2019 by paying the application fee, the officials will analyze and invite the eligible contenders, to take the Recruitment Rounds. As per the data in the advertisements, the applicants have to clear the Written Examination, Medical Examination, Personal Interview. And the performance shown in those rounds are considered. An applicant will go to the next rounds, only if they clear the initial rounds. Keep this in mind and proceed. Remember that there will be huge competition for these exams. So, the applicants have to prepare well. Also, the selected people will good salary. And that will be as per the terms of the organization. So, as this is a good chance make use of it Correctly. B.Sc, Masters Degree, Graduation or Post Graduation from any recognized institute or University. So, check the official site of Rajasthan Subordinate and Ministerial Service Selection at rsmssb.rajasthan.gov.in. And, Pay the application fee. Therefore, Recheck and submit the application by the last date.